Particles left on the floor surface are active agents of wear when ground in by foot traffic. Appropriate measure to reduce the daily dust and dirt on the floor can greatly affect the maintenance requirements for your hard floor surfaces. A comprehensive program designed by GIBB Building Maintenance for your specific hard floor service can go a long way to increasing longevity and maintaining a consistently pleasant look. 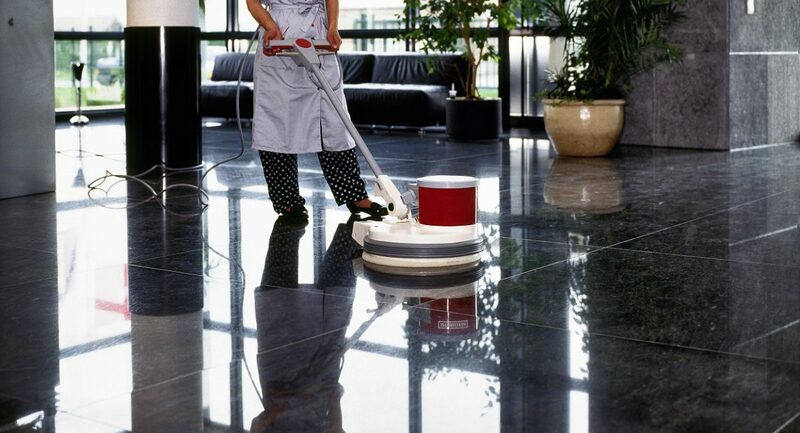 Achieving that “wet look” shine on hard floors requires much more than daily sweeping and mopping. GIBB Building Maintenance offers many different types of methods and materials to keep your hardwood, specialty flooring, marble, sheet vinyl, vinyl composite tile (VCT), concrete, and ceramic tile performing and looking great. GIBB recommends using the correct type and adequate lengths of “walk-off” matting by entrances to dramatically reduce the amount of dirt tracking into your facility. With a regular sweeping/vacuuming and mopping schedule of hard floors, the professionals at GIBB Building Maintenance will be successful in keeping particle levels down within your work environment. Taking these actions to prevent these damaging particles from being ground into the floor will allow finishes to last longer and reduce the need for more frequent maintenance or replacement later on. This means lower replacement costs to you and your business. The most intense ahrd floor maintenance process is stripping and refinishing. This process cleans all layers of the hard floor, and involves completely removing, or stripping all of the existing finish on the floor, deep cleaning the bare surface,sealing the surface to plug pores, and then putting new layers of protective finish back on. In between full scale stripping and refinishing, interim maintenance is required to preserve the sealants on your hard floors. This process of scrubbing and refinishing removes only the top layers of the existing finish and then covers the remaining layers with a new coat of finish. Scrubbing can extend the time between stripping and refinishing events.